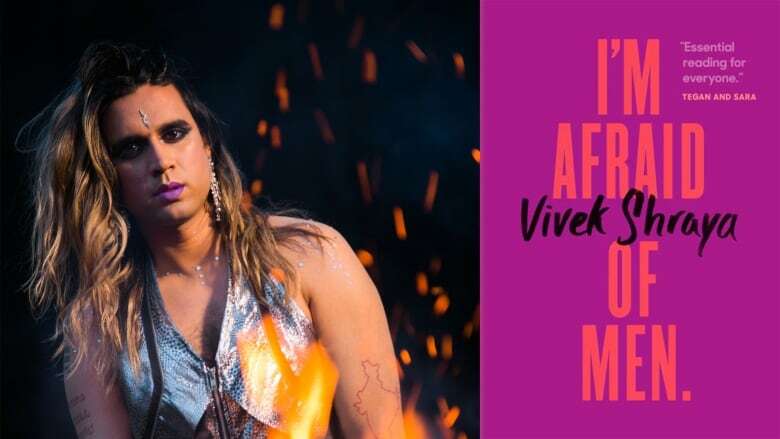 Vivek Shraya's memoir begins with a shocking sentence which sets the tone for her entire essay. "I'm afraid of men because it was men who taught me fear." I'm Afraid of Men explores how fear shaped Shraya's childhood, and how it continues to haunt her present life as a transgender woman. "It never really goes away. My therapist bill is very long," Shraya said with a chuckle during an interview Friday with CBC Radio's Edmonton AM. "My experience in Edmonton was not an easy one." Shraya — who will be returning to her hometown of Edmonton for a reading Saturday night at Litfest Alberta — is a multidisciplinary artist lauded for her lyrical, yet brutally honest work on issues of race, gender and equality. A Calgary-based author, filmmaker and musician, her work includes the poetry collection even this page is white, the novel She of the Mountains and the children's book The Boy & the Bindi. It's taken a lifetime for Shraya to find her voice. Much of her work explores the discrimination she suffered as a child who didn't fit in. One of the most visceral memories chronicled in her memoir recalls how Shraya was spit on at a Mill Woods bus stop. She was in Grade 7 and had borrowed her mother's jacket. She was reading quietly on the sidewalk when she felt something wet on the back of her neck. A woman beside her burst out laughing. "Suddenly I started to feel something landing on my back and after awhile I figured out that a jock was spitting on me," she said. "I was wearing a women's jacket. I was being corrected. "That's what happens to young boys who don't act like typical boys. We are corrected by things like being spit on in public places." By the time she graduated from south Edmonton's Harry Ainlay High School, Shraya said she felt deeply insecure, even paranoid. "Anytime I heard laughter, I would be convinced that people were laughing at me," she said. "That was my experience in high school and in junior high. Even things like laughter were used against me." As a transgender woman of colour, Shraya said she felt compelled to "complicate" the conversation around toxic masculinity and challenge traditional ideas about gender. Even so, reliving her old traumas was painful. Putting the experiences down on paper provided no release, she said. "There is this idea that if you write a story that's painful that it is somehow cathartic for the writer," Shaya said. "It wasn't cathartic. It was actually a painful experience but I was super committed to what I was trying to say and the art always take precedence over me sleeping." While Shaya's book focuses on the trauma she suffered, she has no interest in garnering pity from her readers. "Pity is often used as a way to mobilize people to think differently about their prejudices and to me, that's kind of tragic," she said. "That's one of things Im calling out in the book. Do we need people who are different to have to share their stories of trauma for us to care about their humanity?"